If championships are the best measure of success, then Berra stands second to no one. His 14 World Series appearances, 75 Series games played, and 71 Series hits are all records. A three-time MVP, the Yankee hit 20 homers in 10 consecutive seasons. 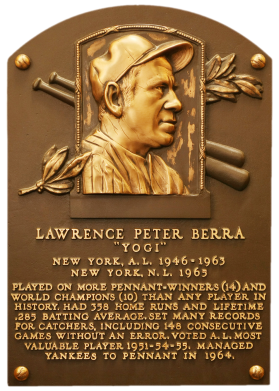 Known as well for his way with words, Berra will be remembered for the oft-quoted "it's never over till it's over." He had 1,430 lifetime RBI to go with his 358 home runs. 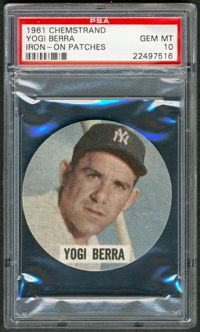 Comments: Yogi was one of the first HOF portraits I purchased. In the late 1990s I purchased a raw 1957 Topps card and it was beautiful. The color was a perfect Yankee blue. The centering was spot on. I submitted the card to PSA and they responded with "Altered". I couldn't believe it. Turns out, the card was power-erased. Somebody had stripped away some of the color on the right side of the card to make the white border match up more closely with the left, to make the card appear more centered. I took the card back to the dealer and he was kind enough to provide me with another slabbed card - a PSA 8. 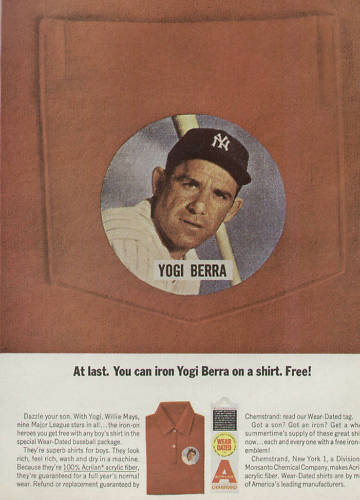 It's still one of my favorite Yogi Berra cards. But, I decided Brooks Robinson would represent the 1957 issue so I needed to find another portrait. I settled on the 1961 Chemstrand card and purchased this PSA 9 in January, 2008 from dealer and hobby friend Marty Pritchard (All Marty's Stuff) via eBay. 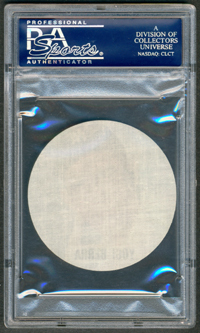 There's been a PSA 10 example I've been eyeballing for quite some time….if the price is right, I'll pull the trigger. UPDATE: I have saved eBay searches for most of the cards in the collection with hopes of finding an upgrade. For Berra, "Chemstrand" would occasionally result in a PSA 10 example. Unfortunately, they were all listed with very high Buy It Now prices hovering around $700. 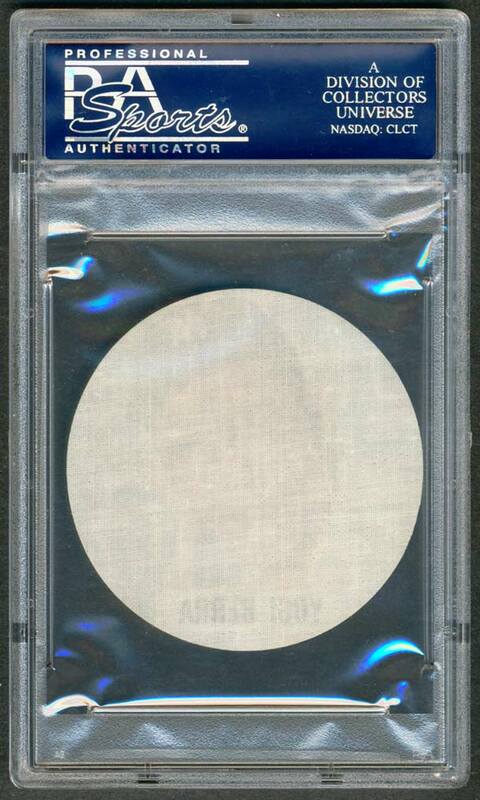 It wasn't a high priority for me to spend this kind of money to bump my PSA 9. 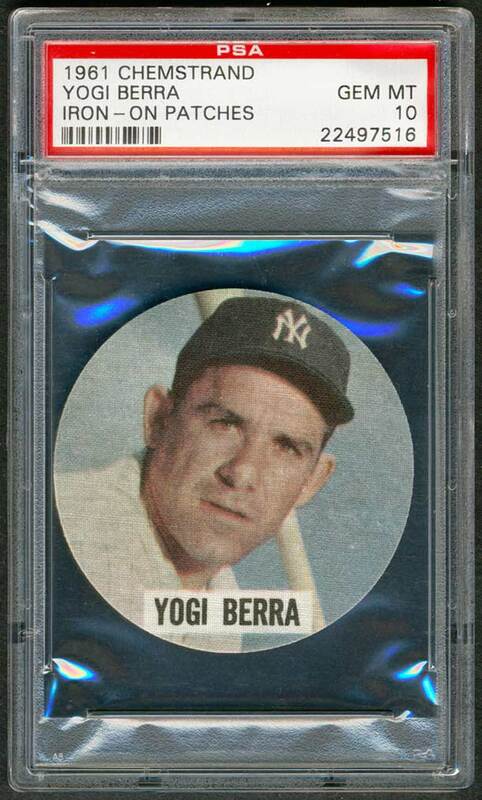 But, in the first week of April 2014 a seller listed a beautiful 10 on eBay and let the opening bid ride. In the last 24 hours the price was just above $50. I had no confidence the price was going to stay under a $100 but placed a snipe for fun and hoped. I couldn't believe it when I won the card from seller nutzaboutcards for $70.99 including S&H. I paid almost 7X that for my PSA 9 so I was shocked at the final hammer price. Hopefully, it was a lucky win at a great price and I could recover some of my money invested in the PSA 9. I have feeling there's just been a huge drop off in demand for this one. These colorful 2-1/2" diameter cloth patches were included with the purchase of a boy's sport shirt for a short period in 1961. 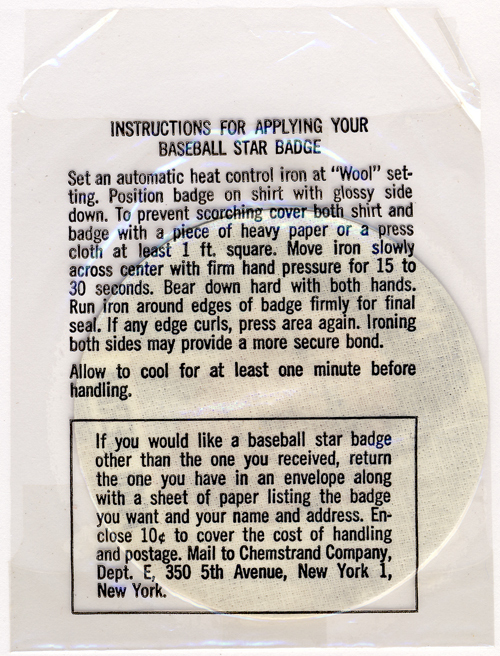 The patches were issued in a cello package with instructions for ironing it onto the shirt.